At last, after lo these many years, a big bandmake that a Tiny Orkesterfrom South Korea. 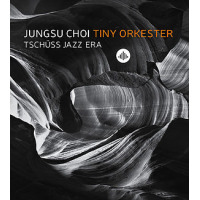 If that's not surprising enough, what is even more striking is that composer / arranger Jungsu Choi's diminutive ensemble (tentet plus voices) is highly proficient and really swings. Choi wrote two of the album's five numbers; the others are Charlie Parker's "Anthropology," an extrapolation of an Ellington / Strayhorn classic ("What If Duke Ellington Didn't Take the 'A' Train?") and Chick Corea's impassioned "Spain." Choi arranged them all, affirming that he is quite conversant with the American jazz idiom as epitomized by our finest contemporary big bands. Choi sets the bar high with "Stolen Yellow," an aggressive flag-waver that sounds rather like a contrafact of "Spain." Drummer Hyunsu Lee is especially impressive behind exploratory solos by guitarist Sungyun Hong, trumpeter Yejung Kim and alto Minkyu Cha while the ensemble doesn't miss a beat and Choi makes good use of flute, piano, brass and wordless vocal to press home his point. The leader then hauls "Anthropology" into the twenty-first century with an angular arrangement that even Bird himself might have had trouble recognizing. The midsection is marked by an acrobatic exchange between flutist Eunmi Kim and tenor Sungil Bae before the ensemble drives the broad-shouldered vehicle across the finish line. There is more tight ensemble work on "Nach Wien 224," an essentially straight-ahead yet insistently modern groover accentuated by another wordless vocal, this one by Jinho Pyo. The venerable "A" Train chugs earnestly from the station behind Jungmin Lee's rumbling barrelhouse piano and what sounds like a clutch of electronic instruments, although nothing apart from acoustic is listed in the booklet. The articulate soloists this time around are guitarist Hong and trombonist Junyeon Lee. Once again, Choi's arrangement is taut and tricky, while the ensemble is on its best behavior throughout. Lee's meditative piano, joined soon by Pyo's voice, fashion a subdued opening statement on "Spain," presaging the familiar melody and persuasive solos by Lee and flutist Kim before the ensemble has the last word. Even though it took South Korea a while to enter the game, Choi's Tiny Orkester leaves no doubt that it is a topnotch player. This is difficult music, to perform as well as to appreciate, and the Orkester has no audible lapses while bringing it to life. As for Choi, he is a talented composer / arranger who certainly bears watching. Track Listing: Stolen Yellow; Anthropology; Nach Wien 224; What If Ellington Didn’t Take the “A” Train? ; Spain. 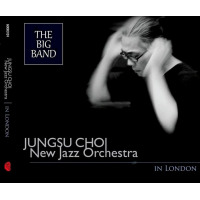 Personnel: Jungsu Choi: leader, composer, arranger, vocals (1, 3); Eunmi Kim: flute; Minkyu Cha: alto sax; Sungil Bae: tenor sax; Yejung Kim: trumpet; Junyeon Lee: trombone; Sehwa Kang: cello; Sungyun Hong: guitar; Jungmin Lee: piano; Joseph Han: bass; Hyunsu Lee: drums; Jinho Pyo: vocals (3, 5); Sehyun Baik: vocal (4).